Use saved sorts on any worksheet. The Sort Assistant add-in for Microsoft Excel lets you save your sort settings and re-use on any worksheet. 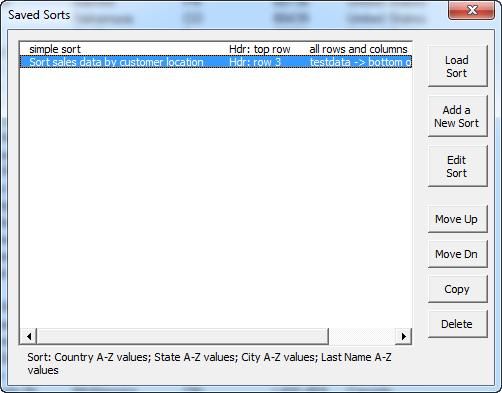 You can save multiple sorts and load into Excel's sort dialog by just selecting in the list and clicking on the load button. It is compatible with Microsoft Excel 2007 to 2019 and Office 365. The buttons on the right let you load a sort, add a new sort, edit an existing sort and re-arrange the list, including deleting sorts that are no longer needed.